I spent three days in Boston4 while you were in Virginia5—had to be there at that date to get a little niece6 from Red Cloud7 started at Dana Hall. "The Little French Girl"8 delighted me. It is certainly the best thing she9 has ever done. It's a little too long, I think, but there's not another fault to be found with it. It is brilliant and beautiful writing. JAFFREY, N.H. from Mary Elizabeth's shop11—(which is not her shop at all it seems!) Several people at Grand Manan12 had sent her checks before I appealed to you; she kept their checks and sent the candy C.O.D.! I shall probably go down to New York13 early next week. I expect to finish my new novel14 before spring. When15 does the Miss Jewett16 come out, and what have you decided to call it the edition17? I shall want you to send out five or six copies for me—or to send them to me to send out with proper inscriptions. And, have you18 a copy of Miss Guiney's19 Happy Ending20 left? I have ordered it in New York and they report it out of print. Document is two leaves, handwritten on recto only of first leaf and recto and verso of second leaf. See #0742. 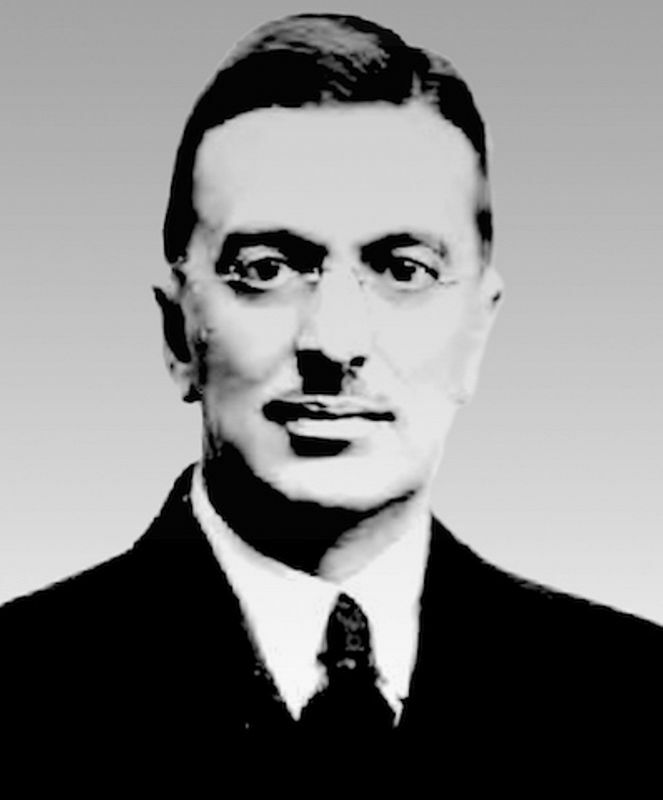 On 9 September 1924 Greenslet reported that after a "tremendous set-to" with the Mary Elizabeth's shop and the Boston post office, he extracted a $5 refund from the shop, which he enclosed. Mary Elizabeth's was a chain of tea rooms in Boston and New York City. Greenslet had a Boston shop send a box of candy to Cather on Grand Manan. 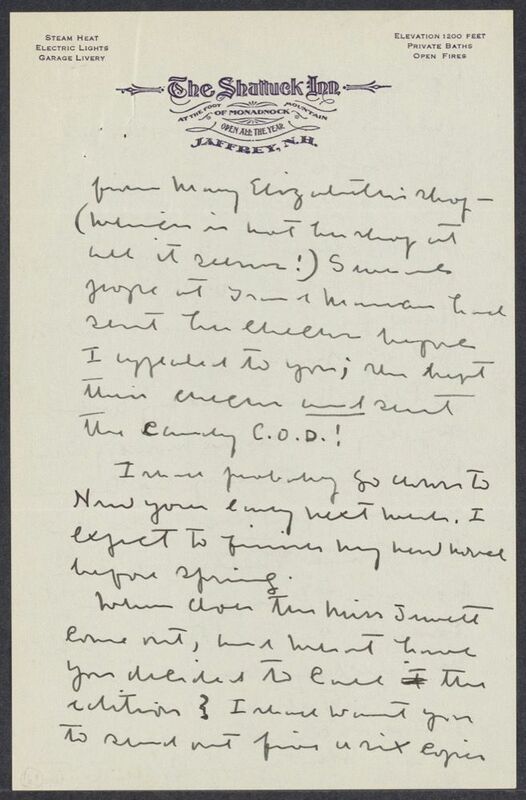 On 9 October 1924, Greenslet wrote that they were planning spring publication and asked if she had any "Heaven-sent inspiration" about what to call the edition. 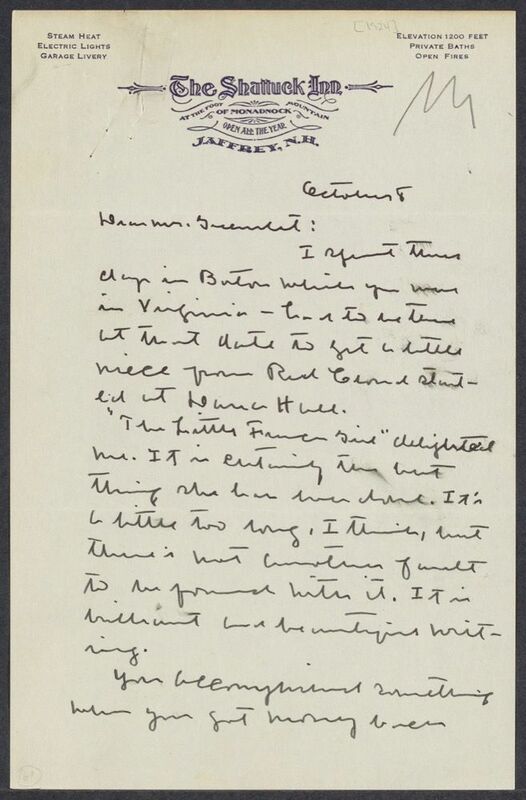 On 9 October 1924 Greenslet informed Cather that the volume was out of print and he had only the file copy, but he promised to try to speak to the poet's sister the next time he traveled to England. 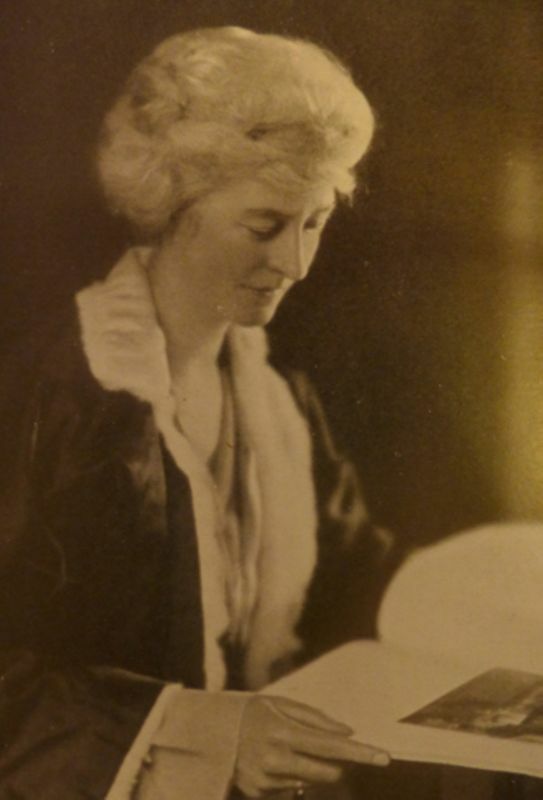 Sedgwick, Anne Douglas (1873-1935). Anglo-American writer. Born in New Jersey, Sedgwick’s family moved to London, England, in 1882; she spent two years (1885-1887) living with her grandparents in Ohio, and five years (1891-1896) studying painting in Paris, France, but thereafter lived primarily in England. Her first novels were published in 1898 and 1899; her tenth novel, Tante (1912), about a temperamental concert pianist, became a best-seller in the United States. Tante and a later novel, The Little French Girl (1924), were both made into films. Sedgwick married British writer Basil de Sélincourt in 1908; both did volunteer work in France during World War I. Although there is no evidence Sedgwick and Cather ever met, through a mutual friend Sedgwick introduced Stephen Tennant to Cather. Jewett, Sarah Orne (1849-1909). American short story writer and novelist. 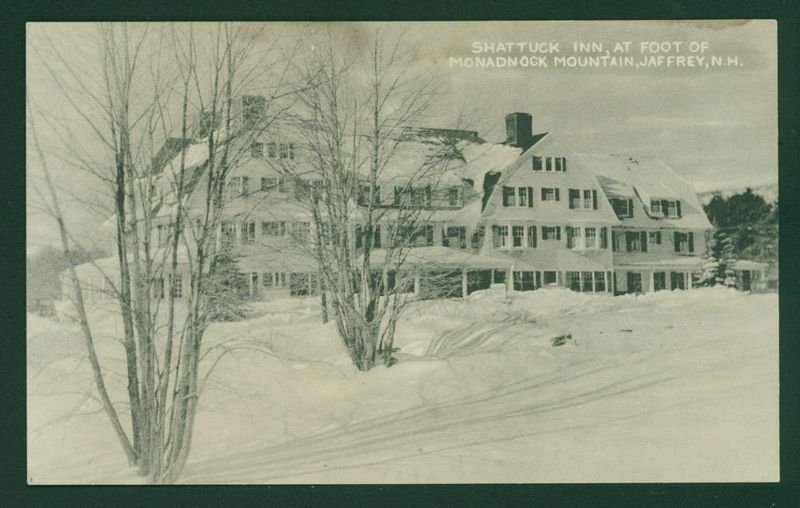 Born in South Berwick, ME, Jewett began sharing homes in Boston (at 148 Charles Street) and Manchester-on-the-Sea, MA, with Annie Adams Fields in 1881, while continuing to live in her family home in South Berwick with her mother and sister part of the year. She was associated throughout her career with the Atlantic Monthly, and her best-known work, The Country of the Pointed Firs, was serialized there in 1896. Like much of her fiction, it focused on rural and small town New England life. By the time Cather met Jewett at 148 Charles Street in 1908, Jewett had largely ceased writing because of a spinal concussion she suffered in a 1902 carriage accident. 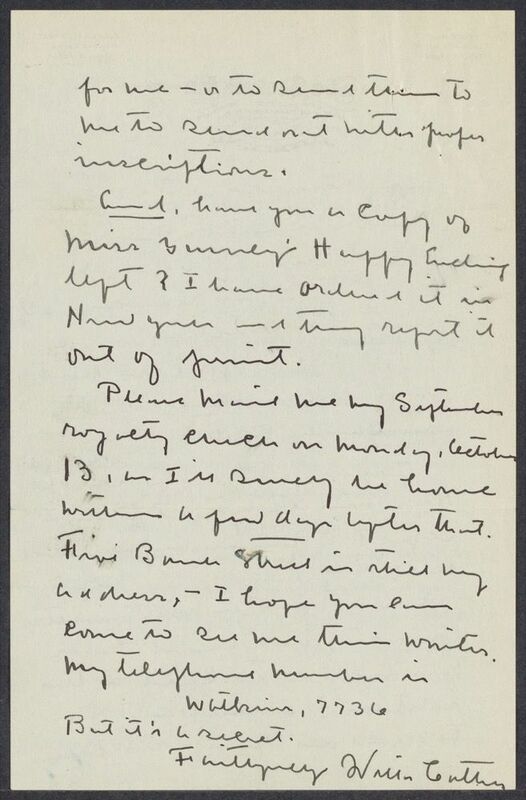 She wrote important letters of advice to Cather in 1908, criticizing her decision to write "The Gull's Road" (1908) from the perspective of a male character, which she called "something of a masquerade" (27 Nov. 1908), and urging her to give up her editorial work at McClure's Magazine so she could focus full-time on fiction writing (13 Dec. 1908). After Jewett's death in South Berwick in 1909, Cather often referred to her and her advice about writing. Cather edited The Best Stories of Sarah Orne Jewett (1925) for publisher Houghton Mifflin, and in her preface classed The Country of the Pointed Firs with Mark Twain's Huckleberry Finn and Nathaniel Hawthorne's The Scarlet Letter as one of "three American books which have the possibility of a long, long life." Guiney, Louise Imogen (1861-1920). American poet and critic. Guiney was born in Roxbury, MA, to Irish Catholic parents. When her father died in 1887 from wounds suffered as a Union Army officer in the Civil War, the strain on family finances nearly ended her education, but she graduated from Elmhurst Academy, an elite convent school in Providence, RI. For the next twenty-one years, she lived with her mother and sister Grace in Auburndale and Boston, MA. 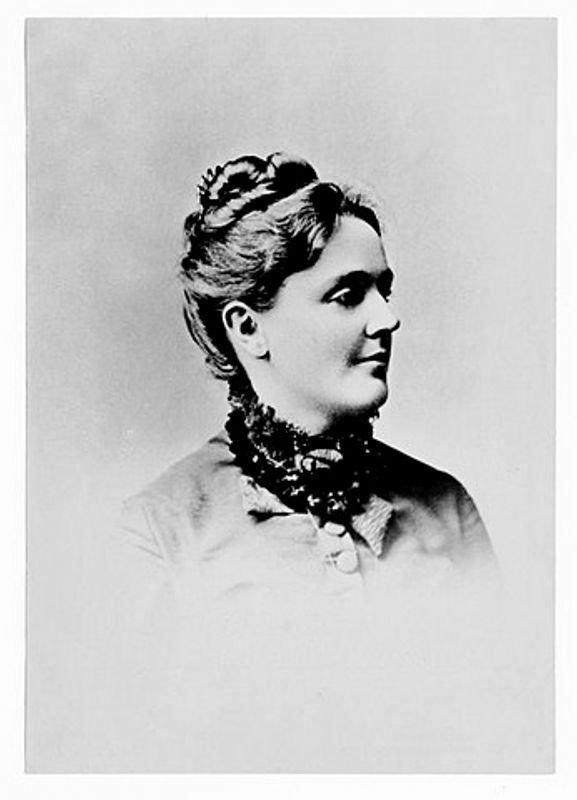 She began publishing poetry and essays in the 1880s and quickly became part of the Boston-area cultural elite, numbering among her friends Annie Adams Fields and Sarah Orne Jewett. In 1894 she received a patronage appointment as Auburndale post-mistress to supplement her literary income. Anti-Catholic protestors boycotted her post office, causing her income to drop, but counter-protesters, literary figures and Catholics from throughout the country, ordered their stamps from her to salvage her income. 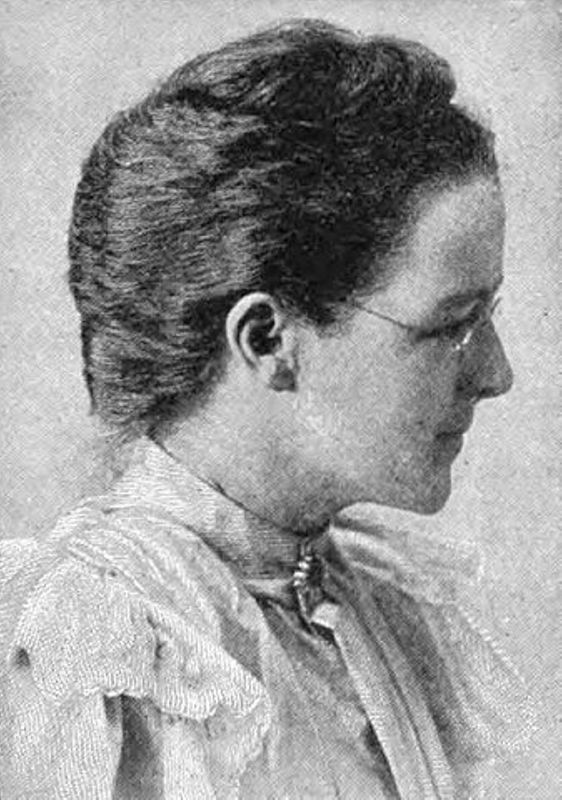 In 1899 she became a cataloger at the Boston Public Library, likely with the intervention of Alice Jordan, her Auburndale friend and neighbor. In 1901, Guiney moved with her aunt to England, where she studied at Oxford University but struggled financially. In theme and content, Guiney’s poetry evoked seventeenth-century British lyric poetry. In the Pittsburgh Gazette in 1902 Cather praised Guiniey’s “excellence in expression and the mastery of meter” and later wrote aspiring poet Zoë Akins that the “richness and delicacy and restraint” of Guiney’s poetry should be a model for contemporary poets (#0152). As an editor at McClure’s Magazine Cather purchased Guiney’s poetry and met her briefly in 1909 in Auburndale, where Guiney was visiting her mother. Thereafter their correspondence became more personal. Guiney died in England. 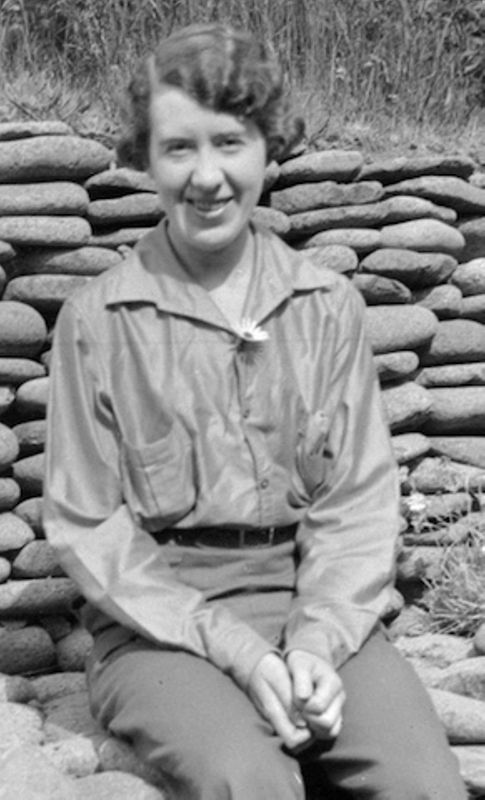 In the 1920s Cather wanted to edit a selection of Guiney’s verse, but Ferris Greenslet at Houghton Mifflin was unable to come to an understanding with Grace Guiney.